Since there aren't any good holidays to look forward to for awhile, I've decided to focus on cultural stereotype-themed dinner parties. It's tough to do Italian without eating a box of pasta or a pallet of meatballs. It's also hard to refrain from Giada-like pronunciations of basic words like Spaghetti. My guests know better than to eat my meatballs, unless they wanna spend the next day puking and pooping themselves sick. I have a meatball curse - you stand warned. When I think Italian, I think about the two most complimentary words in fine dining: Olive.Garden. Fortunately I don't live in the suburbs, so the closest to Darden dining we have in the city is Maggiano's by Lettuce Entertain You. Spending good money on Italian food seems like a terrible waste, considering you can make noodles and sauce in about ten minutes for like two dollars. Even the fanciest of concoctions can be done at home for far less, and probably far better. 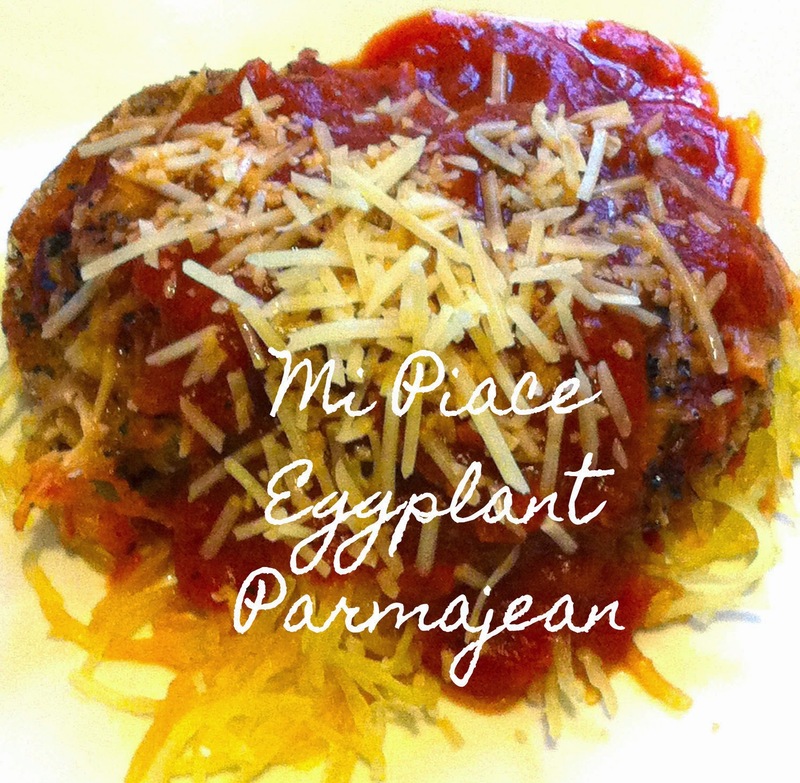 I've heard this dish pronounced as parma-jean, more often than not because I grew up in Ohio. A few summers and studio apartments ago, I went through a phase in which I made chicken parmajean almost every night. I'd sit by an open window and eat my unnecessarily complicated dinner while watching assholes and their brats play in the rooftop pool of the condo across the air shaft. For that reason, I romanticize this. Now that I'm cooking for vegetarians more often, I swapped out the dead bird for dead eggplant, which I recently discovered isn't as gross as it looks. I accidentally had this once at a work function catered by Maggiano's and I don't remember liking it much. Mine's better. 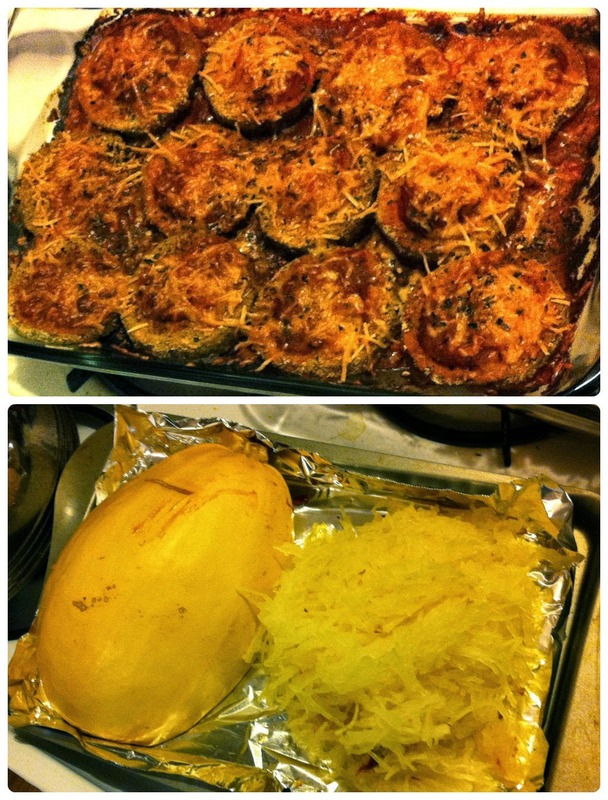 I served it on spaghetti squash because I'm getting skinny-fat. Step 1: Heat oil in a heavy-bottomed pot. Cook onions in seasonings until translucent. Add garlic in the last two minutes. Pour in tomato sauce and a splash of red wine (opt.) Simmer while doing other things. Step 2: Oven to 400. Peel and slice eggplant. Line a baking sheet with foil. Crack an egg into one bowl, and seasoned breadcrumbs in another. 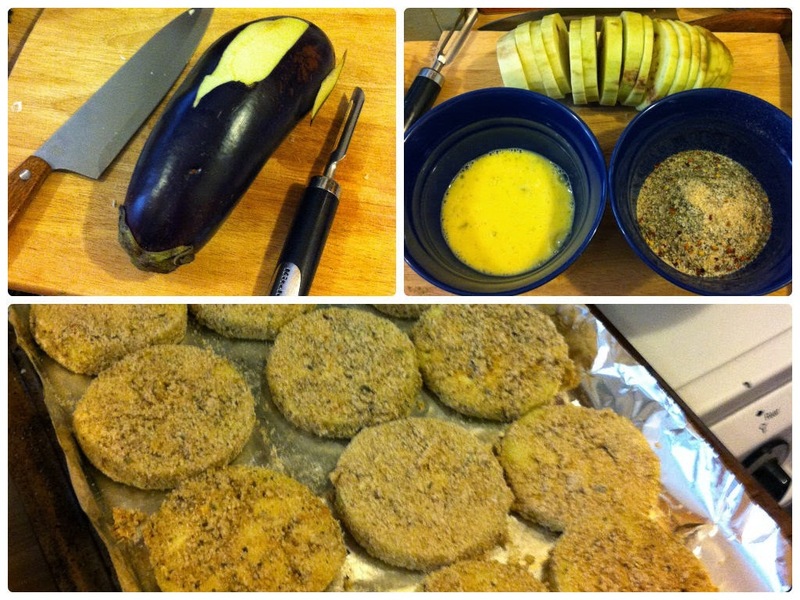 Dip eggplant slices into egg, then crumbs. Bake 5-10 minutes per side or until golden. Step 3: Cut spaghetti squash down the center and remove the guts and seeds. Discard unless feeling crafty. Season inside of squash and bake face-down on a small cookie sheet. Step 4: Assemble! Pour a small bit of sauce on the bottom of a glass baking dish. Arrange eggplant slices in a single layer on sauce. Dab each with a dollop of sauce and then a generous sprinkling of parmesan. Cover and bake along with squash for thirty minutes at 400. Step 5: Scrape out baked squash. Top with a few eggplant slices and more sauce. Finish it off with more cheese!